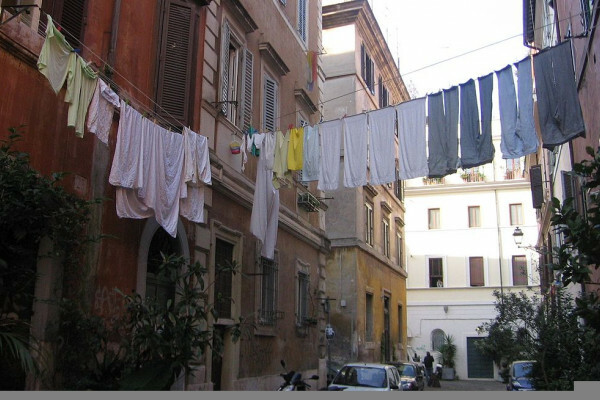 Ben - Laundry detergent containing a special additive could convert clothes into pollution-busting air filters according to research funded by the EPSRC. The additive called CatClo stems from a collaboration between the University of Sheffield and the London College of Fashion. It's based on using nanoparticles of titanium dioxide to catalyse reactions that then break down the pollutants. Professor Tony Ryan, Pro-Vice Chancellor for the Faculty of Science at the University of Sheffield explained how the idea came about. Tony - The problem was posed by a teenage girl and the teenage girl asked me a question about, "Can we use ambient energy to do environmental clean-up?" And it made me think about using the temperature difference between your body and the air, and there wasn't much there, and it just led me to photocatalysis. So, I realised that people are wandering around in the light, can we make light drive a reaction that does some environmental clean-up? Ben - Titanium dioxide is also known as titania and is widely used as a white pigment in products as varied as paints and paper, through to foods, tablets, and even toothpaste. But it's another property, the ability to catalyse reactions in the presence of light that allows it to purge pollution. Tony - The nano-titania has a very high surface area per unit mass. The reaction takes place on the surface. A photon comes in and excites an electron in the titania, that then reacts with oxygen to split oxygen into free radicals. Those free radicals react with water to make peroxide which is bleach and then that bleach oxidises things and it oxidises whatever it comes in contact with. Because it's in the gas phase, the things that get oxidised first and foremost are in the gas phase and so, they will be volatile organics, your smell, and any airborne pollutant. If you're in an urban environment then the concentration of nitric oxide is such that it will take out some of the nitric oxide. Ben - Photocatalysis is not a new concept. Similar chemistry also using titanium dioxide is involved in self-cleaning glass. Tony - The breakthrough, if there was a breakthrough was the realisation that the surface of a piece of self-cleaning glass is basically the length of the square of glass squared. Whereas your clothes, the surface area of your clothes is the surface area of all of the fibres, so it's much, much bigger than the area of the fabric if you were to unfold all the fibres. My suit has an active surface area of getting on for 60 square metres. Clothing tends to be at the level where you want to eradicate the pollution. You take advantage of the temperature gradient inside and out because that gives you a net flux of air and the environmental clean-up agent is perambulating. Even if you have an architectural surface covered with paint that is designed to take out air pollution, you still need the wind and not wanting to make a pun, people make their own wind. Ben - But how much difference could catalytic trousers really make? Tony - A pair of catalysed jeans will take out somewhere between a gram and 2 grams of nitric oxide out of the atmosphere a day. If enough people do that, the numbers build up very, very quickly. So for example, if half of the population of Sheffield were wearing catalysed jeans, we'd be able to bring Sheffield from exceeding the safe limit of nitric oxide which is 40 milligrams per cubic metre, and currently, we exceed it by about 10%, and it would be able to bring us below that value for the whole of the year in the city. Ben - So, a fully catalysed person could make a minor difference, but reaching enough people requires a new approach. Tony - In order for this to work, it has to be universal because the amount that any one person takes out is rather small. So, to take out the nitric oxide pollution from a single car needs about 5 people to be catalysed. So, what you need to do then is make sure that as many people as possible in a city are catalysed and rather than dealing with a brand of clothing, it's much easier to deal with something that everybody does which is wash their clothes. What we're trying to do is get laundry manufacturers to come together to deliver this technology via the laundry. Ben - Of course, anything added to laundry detergent is going to end up in the sewers, so one concern is the potential to change the chemistry in sewers and in water treatment plants. Tony - Sewers is really easy because it's dark in a sewer and the catalyst only works when it sees light. So if a piece of titanium dioxide sees light then it's a photocatalyst. If a piece of titanium dioxide is in the dark, it's a lump of rock. Likewise in the sewage front, 2 millimetres of water is enough to filter out a big proportion of the UV and then the question is, what do titanium nanoparticles do to the bugs in the sewage plant? And that's absolutely something we're looking at. Ben - The researchers are now working closely with a manufacturer of environmentally friendly cleaning products to commercialise CatClo and they hope to have something in the market within a couple of years. They hope that as well as the wider environmental clean-up, these additives will benefit people suffering from asthma and respiratory problems. And Professor Ryan also highlights one other less obvious benefit. Tony - And for Yorkshire man like me, the best thing is it's a license to fart.